Nominative determinism was never so much in evidence as in the title for this new album by Randy Brecker. He rocks. And rocks hard. Jazz-rock – of which nine slices of varying thickness are served along with a sweet relish dished out by the NDR Big Band isn’t everyone’s preferred choice of jazz repast. Lying somewhere between the clean-cut sound of smooth and the hard punch of bop, when done badly it can sound derivative. Done well – as here – it’s an exciting, edge-of-the-seat, knock-your-socks-off mortar bomb of sound. And Brecker’s the perfect man to throw it. 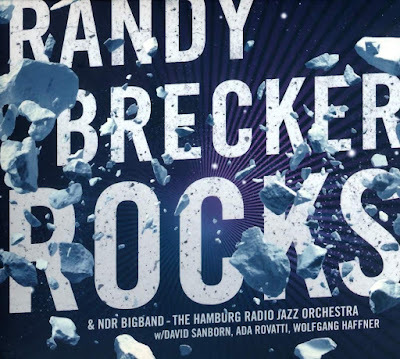 Ever since his ground-breaking stint with his saxophone brother, the late Michael Brecker, in the Brecker Brothers, Randy Brecker’s been 'the guy' you turn to for thrilling sine-wave runs up and down the scales, razor-sharp fiery solos and power; sheer, unadulterated brass power. Add his power to that of the big band, and that of sax players David Sanborn and Ada Rovatti, and the oomph of one of Germany’s top drummers Wolfgang Haffner, and you have a recipe for a surge of musical energy that will blow the fuses. Over nine tracks, the power and intensity doesn’t let up. At all. First Tune of the Set is indeed that – catchy, foot-tappingly intense and with a synth solo from Vladyslav Sendecki so great in mass that it could warp space-time – and sets the tone for the whole album, crescendo after crescendo of riffs and blasts from the big band that are more infectious than cholera. Even though second track Adina softens the mood, it is a purposeful tune that lets Brecker show off a more muted sound and gives space for Rovatti’s up-down-left-right solo. NDR percussionist Marcio Doctor steals the show on the periphery. Squids is quintessential Brecker Brothers (it was recorded on their 1977 album Don’t Stop the Music), funky, staccato trumpets and sax in unison, with the spirit of Mike Stern flowing through Bruno Müller’s guitar. Brecker’s solo two minutes in is short and funkified to the max, with NDR sax man Frank Delle providing a subtler counterpoint and Haffner’s hi-hat pumping like a steam piston. Fifth track The Dipshit – still one of the best song titles in modern jazz – makes you smile, with a hard bop mood offering hints of Horace Silver (in whose band Randy and his brother played), but it’s next track Above and Below, from the Brecker Brothers’ 1992 reunion album, that tops the lot, starting off in fourth gear and accelerating like a rocket, with Sendecki’s keyboard again supplying more vivid colours alongside Rovatti's and Brecker’s fast-paced stabs to the solar plexus. Keep the window closed, Randy!